To make payment for candy you've sold, click here. 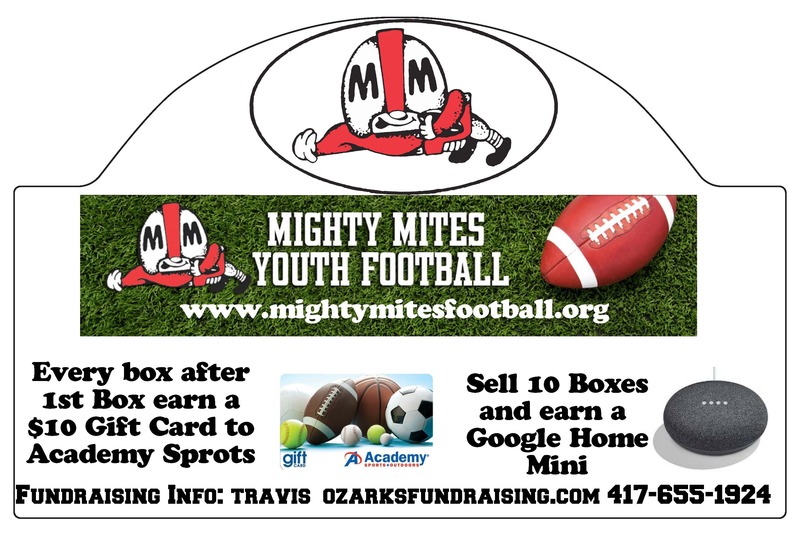 Mighty Mites is funded in part through proceeds from an annual candy sale. All players are asked to sell at least one box of chocolate bars (60 bars at $1 each). Players that do not wish to sell candy are required to pay an additional $30. Candy will be distributed during onsite registrations at each park. Depending on your park, additional candy might not be available until the first practice night. Unsold candy must be returned to Mighty Mites. Contact your park supervisor for the due date on unsold candy and candy money. Players with unpaid candy or money outstanding will not be allowed to play in remaining games. Players may be required to pay for candy in full, or make an initial deposit for candy before receiving the candy to sell. This decision is done by a park by park basis - contact your park supervisor to see how your park is handled. To reward players for their hard work, a $10 Academy Sports gift card will be given for every box sold after the first box - no gift card given for selling one box of candy (sell 5 boxes, get 4 gift cards!). There is no limit to how many boxes of candy a player can sell (or gift cards earned!). Sell 10 boxes and get a Google Home Mini!